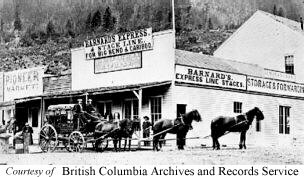 Boston Bar, like other towns along the Fraser Canyon, came to being because of the gold found in the area. Many of the gold seekers in this region were Americans, and because the ships that brought them to British Columbia shores generally came from Boston, the aboriginals, referred to them as "Boston men," hence the name Boston Bar. Boston Bar was also a well known and busy roadhouse stop during the gold rush. According to history, Boston Bar Alex, ran one of the best stops along the way, with good food and sufficient sleeping accommodations. The Building of the Railway also played an important role in this region, first came the Canadian Pacific followed by the Canadian National. In the beginning the CPR's divisional point, at North Bend, across the Fraser from Boston Bar, could only be reached by an aerial ferry. Today there's a bridge. No matter whether you stand on the east or west side of the Fraser, you can see both the Canadian Pacific and Canadian National railways on either side. This is river rafting country. River rafting is a great and adventurous way to get a god look at the Fraser in all it's fury. Access: On the Trans Canada Highway # 1, 42 km (26 mi) north of Yale. Easily reached by car or bus from the Vancouver and points south, and from interior points north and east. Recreational Facilities & Activities: River Rafting, gold panning, rock hounding, fishing, and hiking. During the winter there's snowmobiling and snowshoeing. Local Attractions: North of Boston Bar is Jackass Mountain, commemorating the mules that toiled carrying supplies up and down the steep canyon slopes. Southwest is Hell's Gate, Alexandra Lodge and the old Alexandra Suspension Bridge. Accommodations: There are motels, a hotel, a resort and campgrounds. Located where the green waters of the Thompson River meets with the brown, silt-laden Fraser River, Lytton is perhaps best known as the Rafting Capital of Canada. Numerous first class commercial rafting companies guide visitors through the white waters of these adventurous river routes. For those seeking "tamer" activities, hiking, camping and fishing are all available within close proximity to the town. The site of a native Indian village, Lytton was also along the path taken by hardy prospectors who made their way north to the gold fields. Gold rush history as well as native culture are all visible through the different buildings and activities such as the Remembrance Day Pow Wow. Lytton also lays claim to having one of only a few reaction ferries in B.C. For those not familiar with this type of ferry, it uses the power of the current to propel the craft - well worth a short trip across the river! To add to the uniqueness of Lytton, it also contains the "Lytton Jellyroll" an interesting conglomeration of silt, sand and gravel formed at the end of the last Ice Age. Definitely a destination of unique and exciting adventures! Elevation: 171 metres / 561 ft.
Access: From Vancouver and points south, Lytton is about a 3 hour drive or bus ride of breathtaking scenery on the TransCanada Highway. From the north, it is approximately 85 km (52 mi.) most of it following the winding Thompson River. For a more round about route, but one with spectacular scenery, travel to Lillooet and then down the Duffey Lake Road (Highway 99) through Pemberton and Whistler to Vancouver. Accommodations: motels available; provincial campsite at Skihist just north of town. Yale sits on the banks of the Fraser River, where the canyon really starts to show its dark side. The mountains go down to the river's edge, while the water churns and snarls heading for the Pacific Ocean. This is one of the oldest communities in B.C., and one of the most historic as well. In the year 1848, it became a Hudson's Bay Company fort, named for James Yale, an officer in charge of Fort Langley. Yale gained importance as the inland terminus of the Fraser River Sternwheelers and also the beginning of the "wagon road" to the Cariboo goldfields. When, in 1858, gold was discovered on Hill's Bar, just south of town, the population exploded. Hill's Bar was the site of the very first gold found in British Columbia. Today, there's very little evidence to show that the population swelled to over 30,000 when gold was discovered in this region. Just 22 km (13.6 mi.) north of Yale is the first suspension bridge at Alexandra. 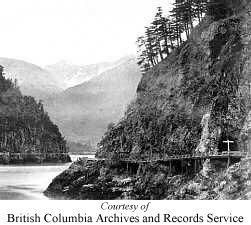 It opened in 1863, taking miners and all their supplies across the Fraser River. It was replaced by the second bridge in 1926 and rests on the original abutments. See it from Alexandra Bridge Provincial Park. 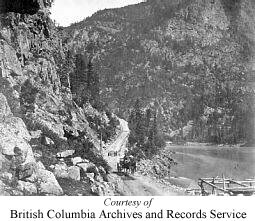 From here you can also see bits of the original Cariboo Road, just east of the bridge. Step back in history, with a historic walking tour of Yale and area, with a splendid view of the Fraser River Canyon entrance and surrounding mountains. Access: From Vancouver and points south, Yale is about a 2 hour drive or bus ride on the Trans Canada Highway. From the Lytton in the north it's 76 km ( 46 mi.) through the heart of the Fraser Canyon. Local Attractions/Events: The Yale Museum; St. John the Divine Church; Pioneer Cemetery; Historic Walking Tour. Accommodations: a motel, and a RV Park and campground.